Forklift Rug Rams, Fork Lift Truck Carpet Poles, Carpet Ram & Rug Pole Attachments for Forklifts at Global Industrial. Vestil Forklift Rug Rams & Carpet Poles Easily Transport Rolls of Carpeting and Rugs. Vestil Forklift Rug Rams are made using a 2-3/4" diameter high strength steel pole that is painted blue and has a tapered tip. Carpet Poles are rotatable and replaceable. Carriage Mounted Carpet Poles are available in Class II or III mounts and feature a spring loaded locking pin for secure installation. 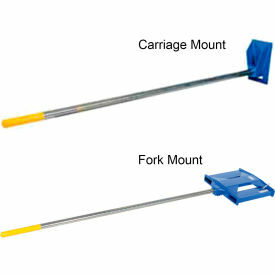 Fork Mounted Carpet Poles feature 7-1/2"W x 2-1/2"H fork pockets on 24" centers. Includes safety restraint to secure unit to the forklift truck. Vestil Forklift Coil Rams Easily Maneuver Many Types of Coiled Materials. Vestil Forklift Coil Rams attachments allow your forklift to handle Coils of steel and similar materials. Choice of 4-½" or 5-9/16" diameter poles to accommodate multiple core sizes. Heavy-duty welded steel construction with a durable enamel finish ensures years of service. Carriage Mounted Coil Rams are for Class II rated trucks and feature a spring-loaded lock pin to secure it to the forklift. Fork Mounted Coil Rams have an inverted design where the ram pole hangs under the forks. 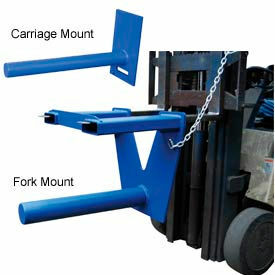 Rams feature 7-½"W x 2-½"H fork pockets on 24" centers and a safety restraint to secure it to the forklift.